AP Boosts in Kingdom Hearts 3 are items that you can collect or earn otherwise. You need Kingdom Hearts 3 AP Boosts, or Ability Point boosts, to earn more Ability Points in KH3. You can find KH3 AP Boosts in chests in various locations, or, as I’ve said, earning them in other ways. So, where can you find AP Boosts, and how can you get them? Well, you’re in the right place/ We’ll show you exactly where to find Ap Boost chests and how to get the boosts in different ways in our Kingdom Hearts 3 AP Boost Locations – How to Get guide. 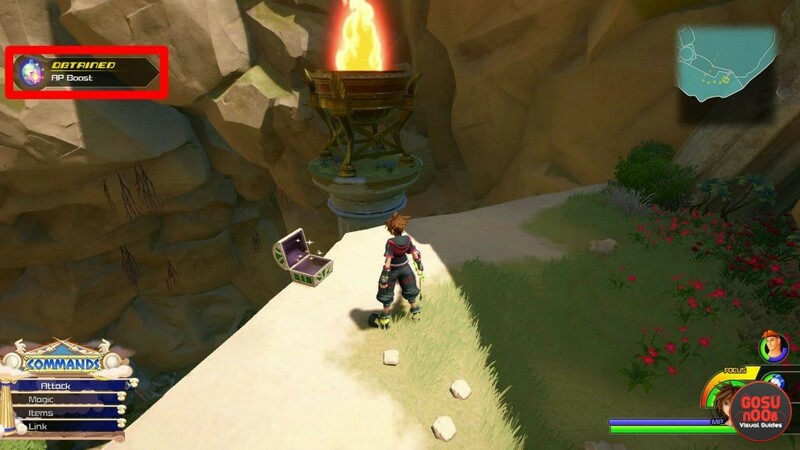 Where to Find AP Boost Chest Locations in Kingdom Hearts 3? To find AP Boost chest locations in Kingdom Hearts 3, there’s a bunch of places you can look. In fact, we’ve found four of them just in Olympus. Start from the Agora region in Thebes. Head left of the Hercules statue, then head left when you come at the crossroads. Run up the wall on the left, then jump across the chasm to the grassy area. You’ll spot the chest with the AP Boost easily. Next up, go to the Thebes: Gardens fast travel point. Now, head down the north path, up the small stairs, and then up the wall when you reach the end of the corridor. Head forward and to the right, and fly across the rubble into the black alleyway. As soon as you round the corner on the left, run up the wall to your left. The AP Boost chest will be right in front of you. Our next step is to go back to the Thebes Agora, and head the other way, into Olympus. Follow the path until you reach the cliff with two statues, one of them holding the head of Medusa. Head left and up the wall, to the stone arch. From there, hop across the rock pillars towards the red archway. Kill the enemies, and head up the wall on the left of the statue of Zeus; the one with stairs drawn on it. Turn you the left, and you’ll spot the chest on the edge of the cliff. To find the fourth AP Boost chest, go back to the statue of the warrior holding the Medusa head, and go into the cave to the north. Go all the way until you reach a dead end, then run up the wall on the left. After that, there’s another, huge wall you have to climb all the way to the top. Walk to the south of the cliff you’ve just arrived on, and look down. You’ll see the chest on a platform below. Now for the chest with the AP Boost in Twilight Town. Our first stop is the second fast travel point, aka The Neighborhood: The Old Mansion. Turn around and go back into the forest. When you reach the fork in the road, take a right. In a couple of steps, you’ll come across a fallen tree trunk that goes above the path. The AP Boost chest is on said tree trunk. Finding the AP Boost Chest in Kingdom of Corona is pretty easy. First off, travel to the last save point in the game, called The Kingdom: Thoroughfare. Turn around, and walk across the bridge. After the loading screen, you’ll be in the Shore area. Just walk forward, and you’ll see the chest on your right pretty quickly. From there, we go to Arendelle, and the North Mountain: Mountain Range fast travel point. Go through the small cave entrance on the right, and follow the corridor into the first clearing. From there, head southeast into the next corridor and clearing. Now, head northeast into yet another corridor. In the next clearing, go into the southeast corner. Hop across the glowing, snow-covered pillars and continue down the path. Hop onto the boulder, then jump across the chasm. You’ll now be in the southwest corner. Go to the end of this small platform, and that’s where the chest is. How to Get AP Boost in Kingdom Hearts 3? To get AP Boosts in Kingdom Hearts 3, there are several things you can do, aside from finding them in the above-listed chests. For example, you can get an AP Boost for taking a photo of the first Lucky Emblem in the game (for more info on those, check out some of our guides on the subject, including Arendelle Lucky Emblem Locations – Hidden Mickeys, Caribbean Lucky Emblem Locations Map, and Lucky Emblem Twilight Town Locations Map. You can also get AP Boosts for completing certain Collector’s Goals, like getting all kinds of mythril, or eight different synthesis materials. Lastly, you can get an AP Boost through Synthesis. You’ll need three Wellspring Stone, three Betwixt Shard, three Twilight Shard, and one Hungry Stone and Hungry Shard. So, those are all the ways you can get AP Boosts in Kingdom Hearts 3, including all of their locations that we know of. In case we missed any of them, please do let us know in the comments, and we’ll be sure to update the article with the information you give us.